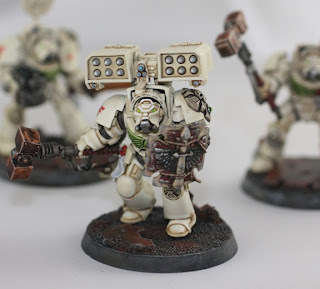 I painted up some test bases to go with both my Astral Claws and my Dark Angels. 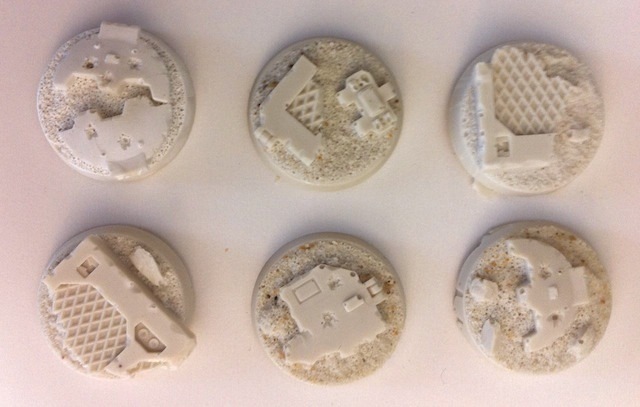 Previously I had been creating custom bases for each miniature every time I needed one. The power of home resin casting has freed me from that now! The Deathwing squad above used individual custom bases, and while they look nice, I wanted a way to create a base quickly that showed off the miniatures. The Rhino top hatch base shown below is meant for a hero character, since it allows for dynamic poses. 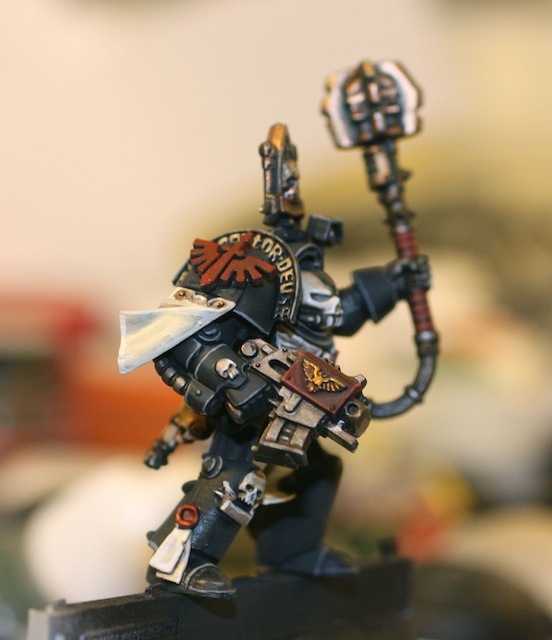 I used one of the new flatter bases for the chaplain, since his pose was rather static, and I was unable to pry his torso off of his legs for repositioning! I am really pleased with how he came out. 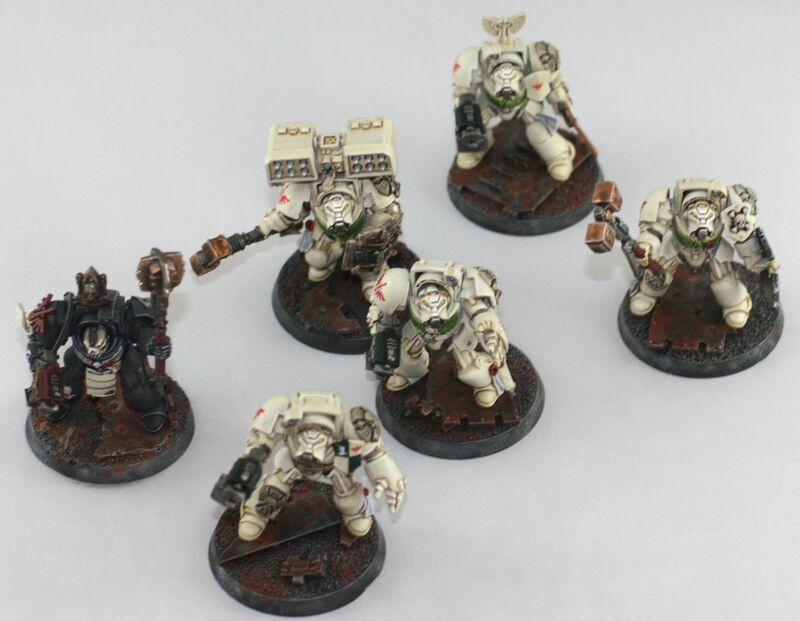 The rest of the Deathwing are a little lighter in color than my other squads, but I am just happy to have three squads instead of two. I think I may have to get a game in once I paint up that venerable dread lurking to the side of my painting area. I finished and based my dark angels terminator chaplain, and then followed him up with another squad of deathwing terminators. The problem was that I was out of bases. 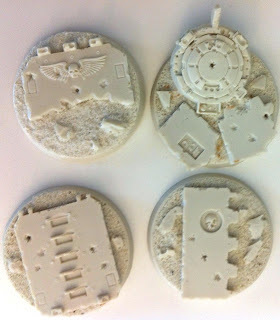 Normally I make a load of bases ahead of time, and then have them ready for miniatures as I finish them. This time I decided to create resin molds of ruined space marine equipment. 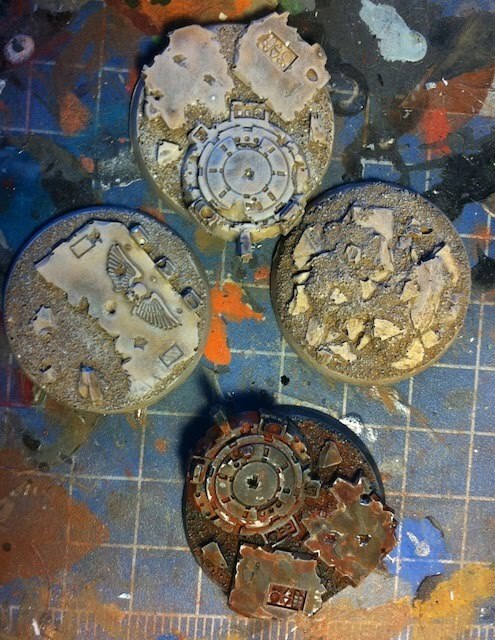 These bases will find dual use on my Astral Claws chapter, which is why some of them are desert brown. 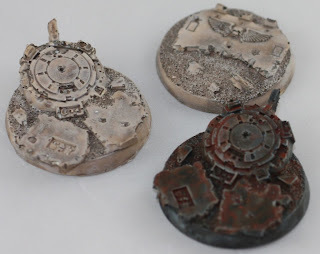 The deathwing bases I paint dark, with loads of rust. Custom bases are just too cool! 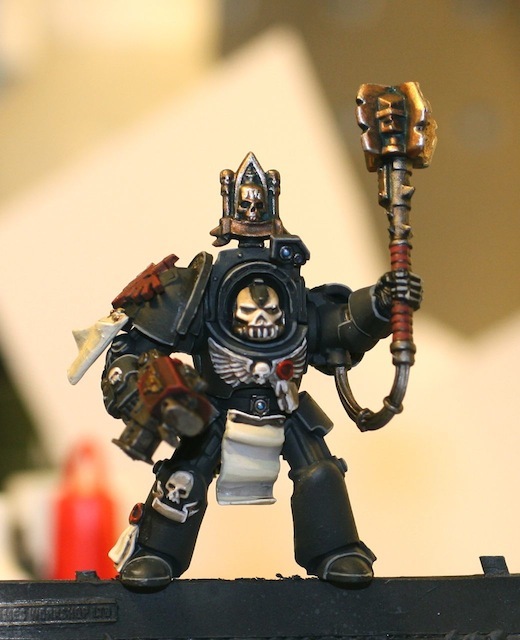 The new DA FAQ has me pretending I am going to play games again, so I decided to paint up an Interrogator Chaplain as my second HQ to hand with Belial. 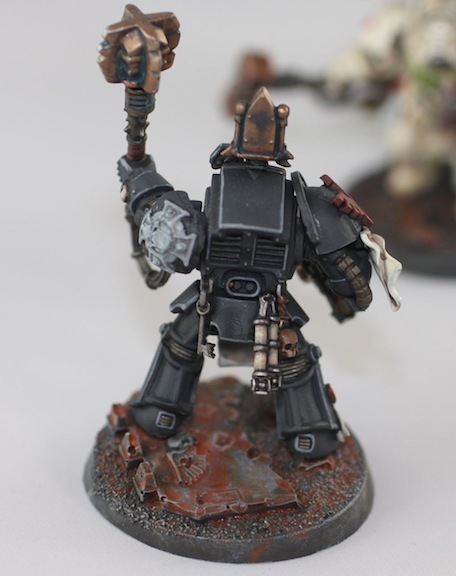 I grabbed an old BA FW crux, the torso from a Chaos terminator, a chaos marine head, and a chaos maul. I added little bits of cloth that came from who knows where, and a key from some fantasy kit. 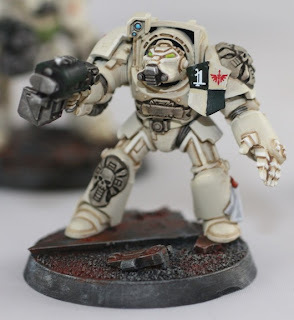 I don't exactly hate the model, but it just doesn't look right to me. There is no mistaking it on the battlefield, so maybe I'll keep this guy as a sort f weirdly static icon of death. 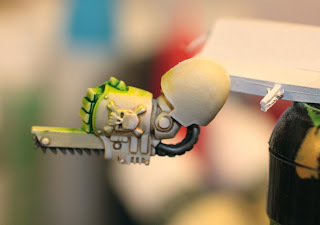 Ron, graciously shared his suggestions on how to improve the glowing power fist I painted in response to his first article, and though I did not have a lot of painting time, I did have enough time to throw down a layer of bleached bone on areas that should not see the glow. The painting is not complete, as real life intruded, but I am much happier with the results already. 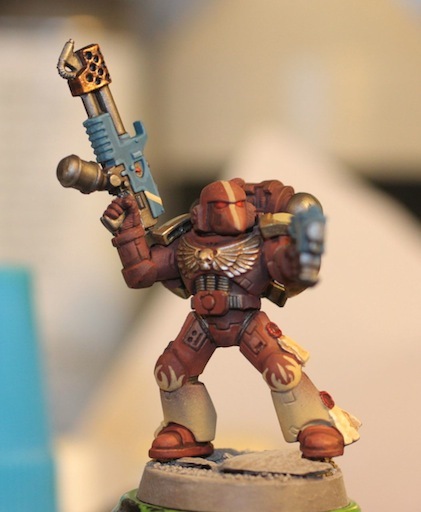 I put down the first base coat for my first Fire Hawks marine last night. The hawks have a pretty demanding paint job, so I had to rely on the air brush to help with the first layers. I have quite a bit of work to do, including more flames, and then targeted washes to tone the whole mini down. 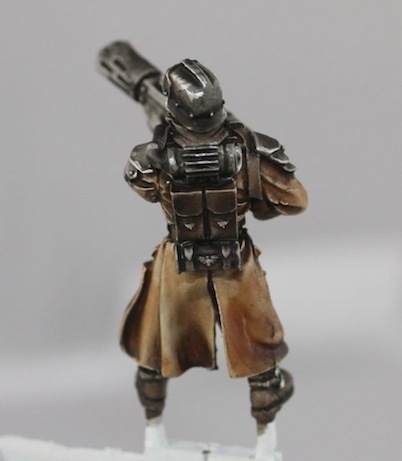 I thought the base coat looked pretty interesting, so I thought I should share it with the community. 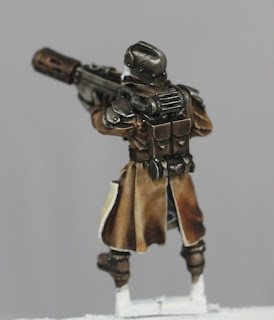 Hopefully once the washes are on I will like the scheme. I am going to keep painting chapters out of IA 9/10 and will periodically post them up if they are not too terrible. I've never tried to paint OSL effects on any of my miniatures. However after reading Ron's tutorial over at FTW today I decided to give it a shot. 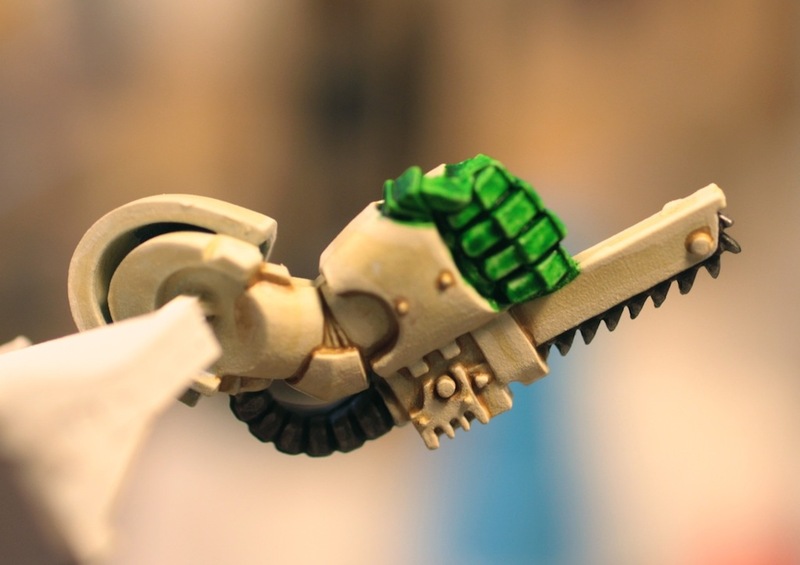 Like most GW fanatics, I have a load of extra power fists, chain fists, and assorted other bits. 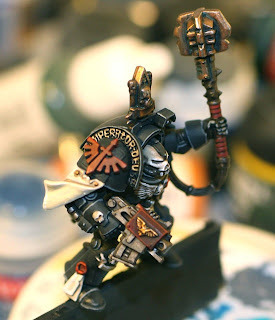 In order to make my attempt as close to Ron's as possible I decided to paint a chain fist. The bonus was that if this worked well I could rip an arm off one of my terminators and give him with some glowing action. 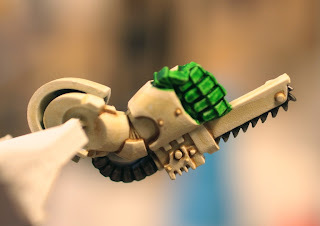 I started with a thinned down dark angels green wash on all the hand parts, painting from the interior out as the tutorial suggested. 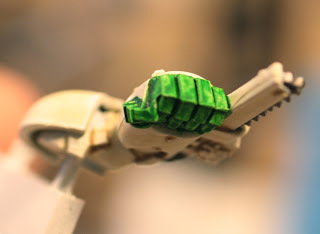 Then I took scorpion green and painted the major plates on the hand sections, leaving the darker green in the recesses. 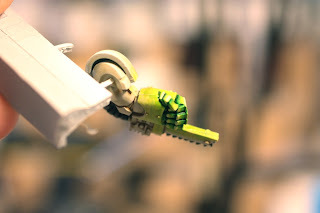 Once this was done I added increasing amounts of yellow to the mix in order to lighten the green, painting all the edges of the hand, and som parts of the chain fist casing with this color. At the very end I added white to the mix to increase the brightness. 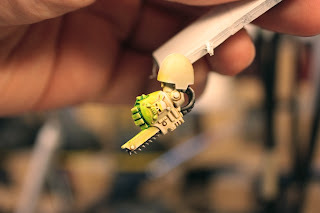 In order to achieve the glow, I used Tamiya thinner to make a wash of the scorpion green/yellow mix, and glazed the portions I thought would be hit by the light. I am not sure I like my version of OSL, but it was a fun experiment. 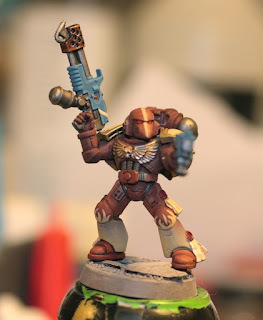 My recommendation to everyone out there is to paint up old bits! Use them as test pieces. 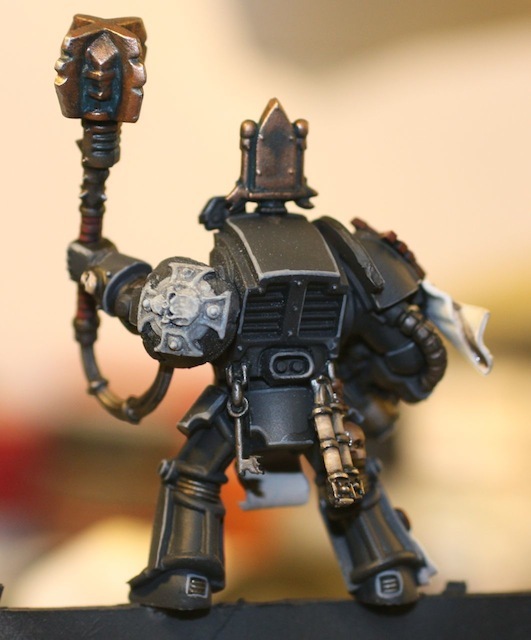 I am going to paint up a helmet now and see if I can make glowing eyes look good. 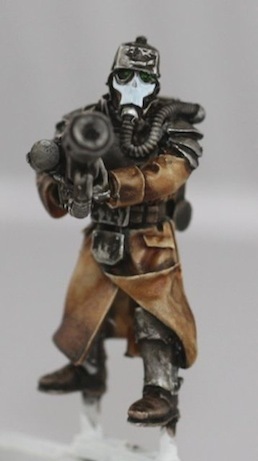 I took a break from DKOK wash experiments last night and decided to paint my FW Tyrant of Badab and one set of MK2 iron armor marines. I have a whole list prepared for my Astral Claws, but I did not want to bother looking at it and just painted a bog standard melta squad. Virtually everything went wrong with these guys! 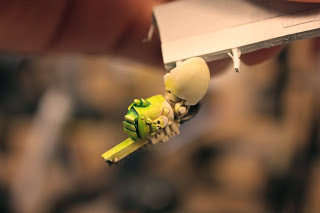 Paint the inner most details first. For some reason I painted all the detail and then tried to go back and do the armor. Have patience. I rushed a lot of armor painting after getting the details done, and then had to use washes to get into the cracks, which obscured detail. Never give up! 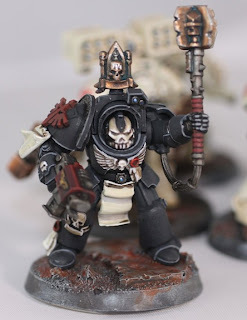 I was at the point of giving up last night and gave the guys one more soft black wash. (using awesomepaintjobs recipe) It toned everything down, and when I saw the minis this morning I kind of like them! Have supplies handy. I ran out of space on the paper plate I use for painting, and just pushed on. Change brushes. My favorite brush is rubbish now. I have plenty of replacements, but I just reach for it out of habit. After this post that brush goes in the the garbage can. It has served me well for 6+ months, but its days have come and gone. Use the airbrush for base coating. 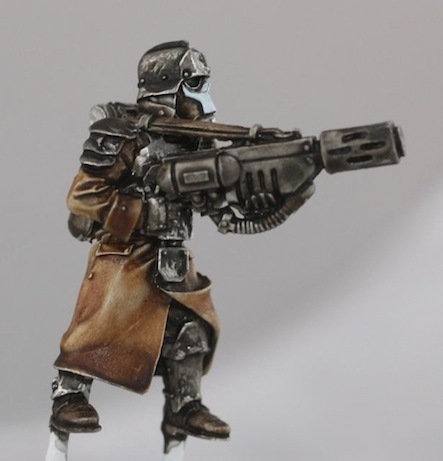 a lot of people don't have the opportunity to do this, but I would love to see some of the better painters on the web put an airbrush through its paces. 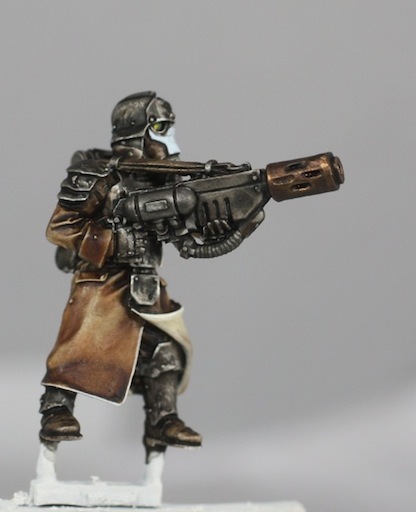 No, in terms of my DKOK, I have to deal with item number 4. I did not bother with my mint color scheme because I did not have an empty paint pot to mix my wash in. 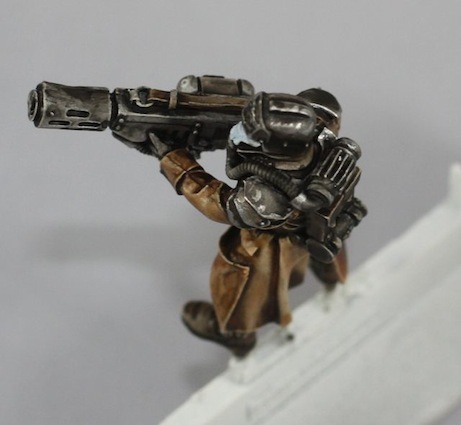 Ron's link FTW to my recently painted Imperial Advisors, and his posting pointing out my wash pooling have been really helpful. Sometimes It takes a nudge by someone else to kick one's painting up a notch. I need to get my figure painting into gear so I am not stuck painting only vehicles for the next Storm Wardens project! Now the real question is whether or not I can go to a GW without buying more minis to paint. As rob from warhammer 39999 noted, I have a very large backlog. 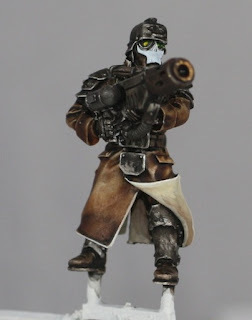 I spent the morning washing my DKOK army, hopefully removing any mold release that may have been left on the models post casting. 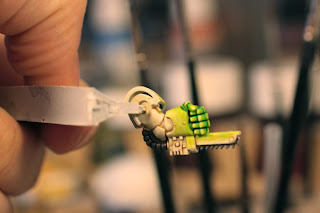 If you do not wash your minis before you paint them, I urge you to start doing so. 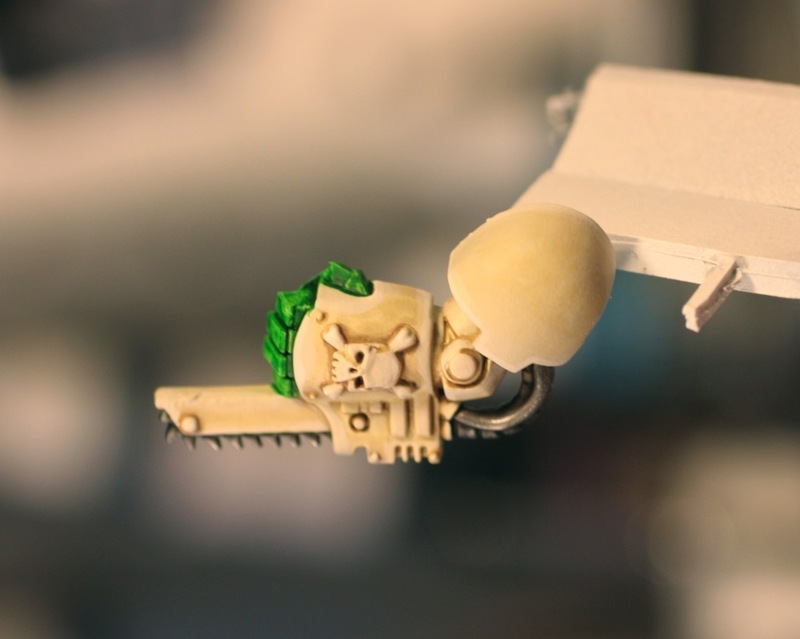 Before I learned the trick I ruined an Inquisitional Rhino with those cool forge world doors. Mid-way through painting the paint rubbed off the doors. The model is still awaiting a bath in green stuff nearly a year on out. I could not resist a quick paint job, and grabbed one of the grenadier melta-gunners to see how washes would look on him. I am not sure about the paint job. 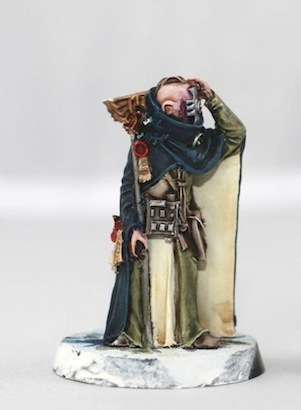 I was planning on making the DKOK mint colored like my valdor, but right now I am not sure. 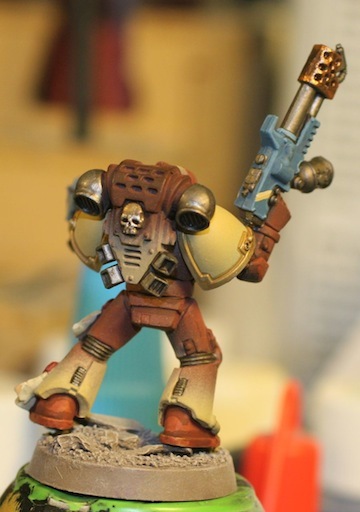 Should I commit to this paint job? These two sets of models sit with stark contrast of another. The dark eldar slave models are very old, and I painted them as a sort of lark. 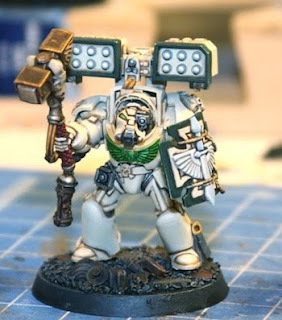 Imagine my Inquisitor strolling into battle with 'bodyguards' of this type. 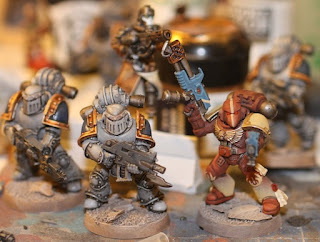 The other models are forge world resin retinue models from the Hector Rex kit. The two sets of models are so different looking it is as if two completely different companies made them. The models inhabit different universes. 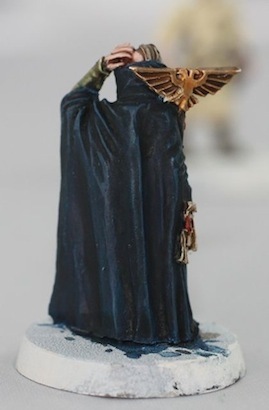 FYI Don't gleefully show your wife the dark eldar slave models if you her to keep playing 40k games! At long last a new Dark Angels faq upgrades DA equipment to 5th edition! 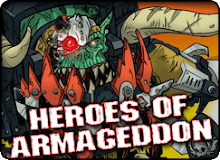 That makes my thunder hammer, storm shield, and cyclone missile launcher guy awesome! When I built this model I did it just for fun. In 4th edition codex game terms he just does not make sense. 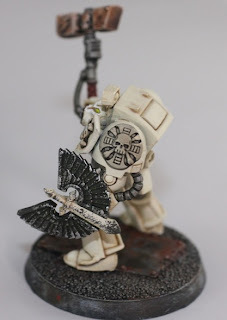 But now, he is a beast, with that shield finally providing protection, and his cyclone firing two shots instead of one. 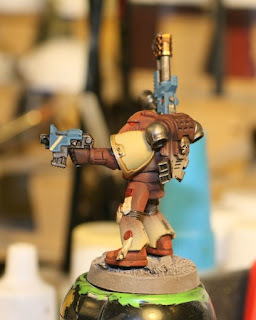 I think I may catch the DA fever again and paint up another terminator squad! 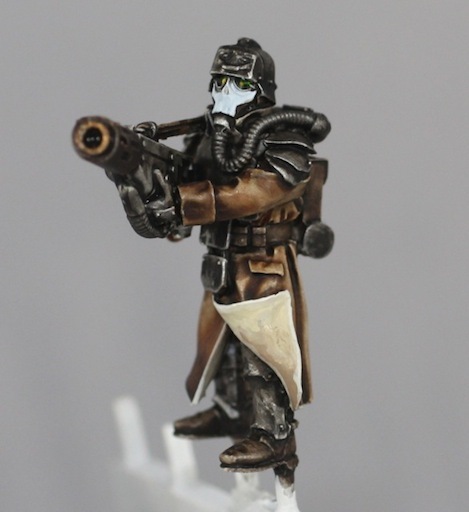 My new painting style does not fit very will with my existing guard, but I decided to keep experimenting with it just because. 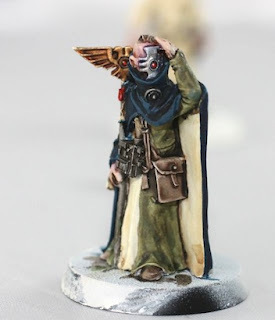 I painted up two Psykers. 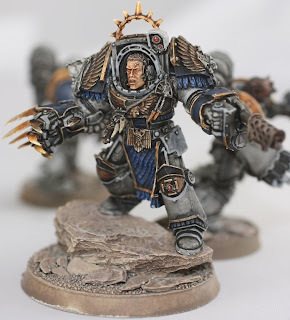 One of them is a Forgworld model that comes with the Hector Rex model. Some of the details are still not done, and I have no idea how to base them. Right now I am focussing on just having fun painting. I've found a lot of different quality in the resin. Some of the models do not obey human anatomy very well. I wonder if this is just a case of old fw versus new fw. All of the newer models have been spot on. 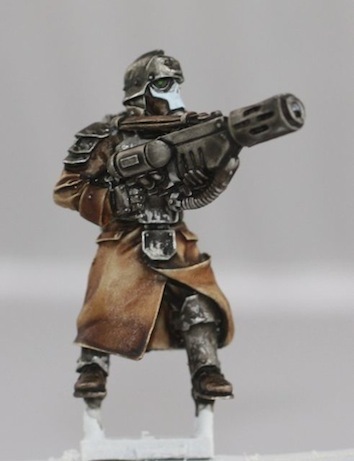 I think it might be time to finally start the Krieg army. 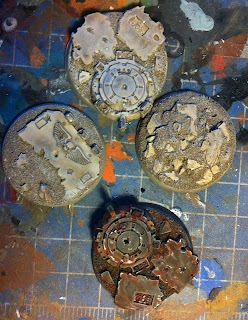 I am getting comfortable with making my own washes which seems to be a pre-requisite when working with resin kits.